WASHINGTON CITY — A Washington City woman was arrested Sunday after she was found in possession of drugs while attempting to shoplift items from the Washington Wal-Mart, located at 625 West Telegraph Road. Anita Tilley entered Wal-Mart on two separate occasions Friday where she gathered several items and concealed them inside canvas and plastic bags in her shopping cart, Washington City Police Officer Laynce Bartruff wrote in a probable cause statement supporting the arrest. After concealing these items, Tilley left the store without paying for them. On Sunday, Tilley went back to Wal-Mart, gathered up more items and tried to leave the store again without paying for the merchandise, Bartruff said in the statement. Members of Wal-Mart loss prevention stopped Tilly before she could leave, took her to their office and contacted police. “When I asked Anita about the incident she stated that she had gone through the checkout line and the lady did not ask her to pay for the items, so she did not,” Bartruff said in the statement. While searching Tilley, Bartruff discovered several white pills in her coat pocket, he said in the statement. These pills were later identified as hydrocodone, a narcotic pain reliever and schedule two controlled substance. In Tilley’s purse, officers also found more hydrocodone pills mixed in with other pills identified as chlordiazepoxide hydrochloride, a schedule four controlled substance used to treat anxiety, Bartruff said in the statement. 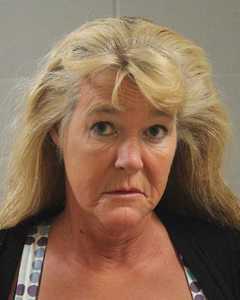 Washington City Police Public Information Officer Ed Kantor said he did not know the exact items Tilley allegedly took on Friday, but that on Sunday she was attempting to steal a container of alcohol. Tilley was arrested and booked into the Washington County Purgatory Correctional Facility. She was charged with a third-degree felony for possession of hydrocodone; and four class B misdemeanors for possession of chlordiazepoxide hydrochloride and retail theft. At the time of this publication, Tilley has been released from custody, according to current booking information. “the self check out line”. She forgot to ask herself to pay for the item, so she didn’t pay. Sounds reasonable. Heck, I even get change back for stuff I don’t pay for at the self check out.